At Jeffrey Scott Fine Jewelry, we strive to be on the cutting edge of jewelry manufacture, instead of only repairing or crafting jewelry the old fashioned way with a torch, we have custom on site laser welding. With the laser welder, as the company says, "the only limit to fine jewelry fabrication is your imagination." 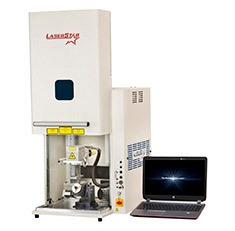 Laser welding as opposed to soldering is a much cleaner way of crafting or repairing, gold, silver and platinum, leaving no seams. And without heat delicate precious stones are not at risk as they would be with a torch. Even your broken glasses can be fixed with a laser. When you are making a custom piece of jewelry from a photo or your imagination, the old fashioned way, is to have a model maker carve you a wax, and then if it is not to your liking or must be modified, often a new wax must be made, or the original modified, which is very labor intensive and carries with it a greater price tag. With the custom on site CAD design, you can change your design multiple times before the wax is finally created, allowing you the customer to see the proposed design before casting, and at a much lower cost to you. At Jeffrey Scott we offer on site repair work, either by laser or by traditional torch - goldsmithing, silversmithing, stone repair, resetting, you name it. No job is too great or small. Jeff does the work on Wednesdays, when we are closed so he will not be disturbed. So drop off your work by Tuesday at the close of business, on most jobs, have it back on Thursday, unless it is more involved, it may take a bit longer. 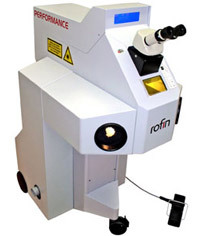 In some instances he may be able to offer you while you wait service for certain types or repairs by laser. But we are a "mom and pop" operation - you deal with the owners at all times, so certain jobs, if more involved requiring Jeff's undivided attention, without interruption. will require that he works on it when we are closed to the public. If you are concerned about leaving your stones, don't be - we have been around for several decades with an impeccable reputation. It is a shame that a few bad apples have given rise to suspicion which causes the bulk of jewelers out there who operate honestly to have to reassure customers. Irene is an attorney and has the highest standards. As she says, how can these unscrupulous types lay their heads on their pillows at night and live with themselves, when switching people's stones? When we take in your stones, to reassure you, we put them under a microscope. We then plot any inclusions and take the dimensions of your stone in millimeters and give you a copy of this information as well to take with you. No two diamonds or precious colored stones have the exact same dimensions or inclusions, these are the fingerprints of your stone. We keep one for ourselves as well. When you return to pick up your item, we put it under the microscope and show you the inclusions, and remeasure the stone in front of you, so you know you are getting your same stone back. This method protects us and protects you as well, and gives everyone peace of mind. At Jeffrey Scott we do custom on site computerized engraving, and can engrave most items of jewelry and even can engrave images, logos, plates etc. If your piece requires hand engraving, we have a hand engraver with over fifty years experience at our disposal. We do on site gold and rhodium plating as well. If you need an item of jewelry appraised for insurance or estate purposes, we have a full service shop where all necessary testing can be done, and we do computerized appraisals, where you receive a full computerized five page lab report. We just ask that you make an appointment. Jeff will do all of the necessary testing in front of you, you never have to leave your jewelry. You may just need to come back for the report or we can mail it, or even fax it or pdf it to your insurance agent should you so require at no additional charge. There is no charge either for an update. You only pay once, for the initial appraisal service. We offer free computerized updates to your appraisals, forever. And if you purchase the item from us, there is no charge for the appraisal. If you have a watch that needs repair from a battery, to a pin, to a band adjustment, to a cleaning, overhaul or other repair on your watch, no matter the make and model, we can take care of it for you. If your pearls need restringing, they are in good hands with us and our expert stringer who has decades of experience. Also, at Jeffrey Scott we specialize in custom design, and hand fabrication as well, making you a completely hand made piece of jewelry from start to finish. Bring us a picture, a drawing from an image in your head, and we can make your dream a reality. If you can imagine it, we can create it. We also have decades of experience in antique restoration, taking an old, antique piece in need of refurbishment or seemingly beyond repair item of jewelry, perhaps of sentimental value bequeathed from a beloved relative, or purchased by you in your travels or in an antique store, and we can reinforce and restore it to like new condition, so that you can wear it and enjoy it without worry. We specialize in these areas of custom design and restoration, and Jeff in fact loves to do this kind of work, as it is challenging and very satisfying when you view the finished piece.